Photo By (Student Involvement/Official Website). 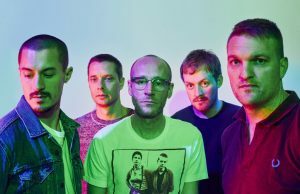 For over a decade, California-based soul rock band Cold War Kids has performed on countless stages, made festival appearances, released viral singles, and taken the indie scene to uncharted territories. Now, they will be the first-ever performance group at Mason’s Homecoming Week. Anthony McLean, marketing and communications coordinator for the Office of Student Involvement, shared that having a concert for Homecoming Week was in hopes of acclimating new students to Mason, whilst maintaining consistent awareness about what their office offers. “We’re trying to think of new ways that would be more exciting to students”, said McLean. To keep a constant flow of programming between Welcome Week and Mason Day, they figured that adding a show in-between these large-scale events is another opportunity for students to explore their campus in a way unseen before. Cold War Kids started their musical career with their debut album Robbers & Cowards (2007), a hidden gem completely trickled with anthems and coffeehouse classics. The band made attempts to change their style between albums Loyalty to Loyalty (2008) and Mine Is Yours (2011), but it was not until hits like “Miracle Mile” and “First” to where the band started to top indie charts. It’s all thanks to their fourth album, Dear Miss Lonelyhearts (2013) and fifth album Hold My Home (2014), for their greater audience reach. With influences from Modest Mouse and Florence + the Machine, their newest album, LA Divine (2017), is a piano-ridden setlist that plays off of familiar guitar riffs and beach pop undertones. They recently finished up their LA Divine tour in the U.S., and are taking their tour overseas and to music festivals later this year. Go to Homecoming Week’s event page for full ticket information.